Viking Easylay Cold Tarmix is a 7mm graded chipping bituminous pre-mix and is ready for immediate use. Easily available in small order. No Waste and ideal for gradual use condition. It is a quality, easy tp use, cost effective product – no contractor required. Repairs of broken road surface, pot-holes, footpaths or sidewalks. Paving for carparks, residential driveways, village roads, mountain or hill roads, road in isolated islands. Paving for walkways railway station, school, hospital, recreation park, sport ground, warehouse, amusement park, shopping areas and etc. 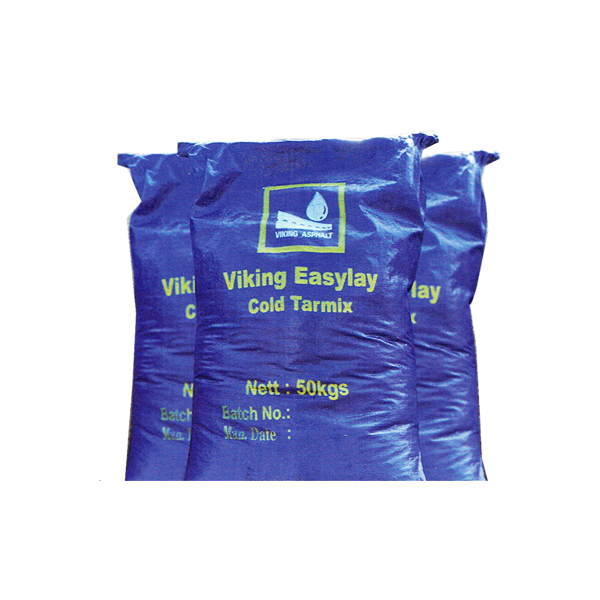 Viking Easylay Cold Tarmix comes in 50kg bags. One bag will cover approximately 2m square at a 25mm compacted depth.